The effects of neurodegenerative diseases can be devastating for patients and their families. In 2007, the United Nations stated that 1 in 6 people in the world are affected by neurological disorders including diseases like Huntington’s, Alzheimer’s, and amyotrophic lateral sclerosis (ALS). With over 600 characterized neurological disorders yet very few treatments, it is imperative that continued research efforts elucidate the mechanisms underlying these diseases in the hopes of developing targeted and effective treatments. As part of the FlyBook inaugural chapters published in the October issue of GENETICS, McGurk et al. put forth the fly as an in vivo model for human neurodegenerative disease and describe how the fly is a vital tool for providing mechanistic insight. As most Biology 101 students can tell you, the fly has been a widely-used tool in biological research for over 100 years! Gene manipulation in Drosophila can be fast and relatively simple, and, with short generation times, fly lines are maintained with relative ease. Additionally, fly models offer unique advantages specific to studies of the nervous system, as the organism has a central nervous system that bears striking similarities to that of mammals, though is less complex. The Drosophila genome is also much smaller than the human genome, allowing easier interpretation of results from gene manipulation studies. McGurk et al. adds to previous reviews on the subject of fly models of neurodegenerative disease by focusing and describing select studies to emphasize the strengths of such approaches. To do this, McGurk et al. describe studies on polyQ diseases and ALS. PolyQ diseases, a group of diseases that include Huntington’s, are characterized by the expansion of a CAG trinucleotide repeat within the respective gene. Transgenic flies that express the expanded repeat mutation show neurodegenerative effects remarkably reminiscent to those seen in humans. These studies illustrate the power of fly to recapitulate human disease features, providing a system with which to elucidate causal genetic mechanisms. ALS, also known as Lou Gehrig’s Disease, is the most prevalent of a group of motor neuron diseases that involve the death of neurons. Affecting as many as 30,000 Americans, ALS onsets in individuals as adults, impacting the spinal cord and leading to paralysis and, ultimately, death. For the most part, the cause of this tragic disease has been veiled in mystery for decades, but recent advances in identifying the genetic underpinnings of the disease have been facilitated by enhanced genomic technologies. These findings indicate that many genes related to the disease are involved in RNA biology, suggesting that such activities are involved in the pathology of the disease. Focusing on one such identified gene, TDP-43, McGurk et al. illustrate the power of fly models to investigate this disease. 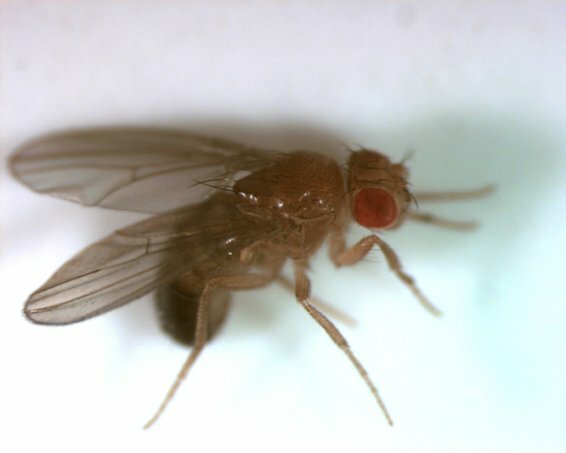 Fly studies for example, were critical for the identification of ATAXIN-2 as a gene that modifies, and consequently adjusts the toxicity of, TDP-43. Researchers proceeded to investigate this modifier and found that mutations in this gene were regularly found in ALS patient populations, characterizing it as a definitive ALS disease gene. This illustrates the impact of combining findings from model organisms with those of genetic analyses to expand our understanding of disease. Although flies look quite different from humans, flies share a remarkable amount of similarity to mammalian neurodegenerative disease pathologies. The examples described by McGurk et al. illustrate the power of such models and the breadth of understanding that can come from them. With the necessity for the development of therapeutics for the hundreds of neurological disorders looming, perhaps the solution is in approaches that combine the historic model system of the fruit fly with the sequencing innovations that develop further everyday.